Past few days, my wife has been preparing her presentation on a research subject. She is a cognitive psychology Ph.D. who also has background in computer science and mathematics. I sensed that she was in a writer's block, or "presenter's block" I should say. We finished our dinner at home on Saturday, and we just finished watching an episode of 24 on Netflix. She asked, "One more episode?" I said "Sure." We were excited about the story and we wanted to keep watching to find out what happens next, but I also noticed a cloud in front of her face. After watching the next episode, I asked her if she wanted to tell me about her research and the talk she was thinking to give. She slowly started to talk to me. Why do we procrastinate? I don't think we procrastinate when we are already in a fire fighting mode. We procrastinate when we still have some time before the hard deadline yet we have not figured out the clear path towards the work-done. That may not be the only cause for procrastination, but I think this is very common among the people who work in researches or any creative tasks. By definition, creative workers need to deal with a lot of unknowns and big uncertainty. Even after the research is done and we have a result to show, how we convey the research as a story remains as another creative task. The same can be said when we have already created a product, but we need to come up with the best business case and sales pitch. They must all be in our brains, yet we don't know how to take them out piece by piece and arrange them so we can best communicate with others. After sitting in front of the computer without any progress, I typically open a web browser to check out the news website that I've already checked earlier in the day. As the sunset nears, I'd get uncomfortable feeling in the stomach, and I know it's there because I am not focusing on what I should be. I'd get lightly depressed, and that is not helping me to be creative. It's a vicious cycle indeed. That happened a lot when I was a Ph.D. student. 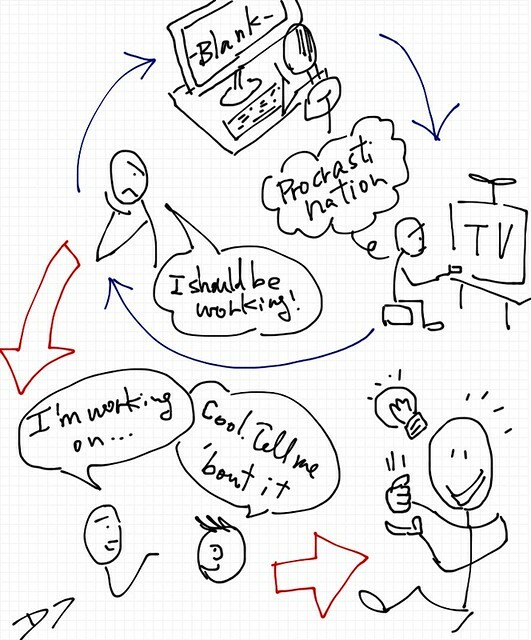 It seems that I am successfully avoiding the trap of procrastination after I started to work in a company. It is clearly not because the task is better defined not requiring me to be creative. The tasks I perform do require a lot of creativity. It's true the deadlines are taken more seriously than the time I was a student. But the threats of deadlines only do not lead me to creative solutions on time. Why am I doing better then? I believe that the answer is in the team environment. I feel secure enough in the team that I can talk to my colleagues about the issues I am stuck with. If it is about solving a problem, talking to our peers help us to sort out the known facts and unknowns more explicitly. Our colleagues may also help us escape from the prejudice; in business, it is common that there are many ways to solve a problem. But it is hard to think out of box when one brain is fixated in solving a particular piece of puzzle without looking at the whole picture. My wife's case was preparing a talk. When we prepare a big talk, we picture ourselves in a room with many audiences with blank faces. They are not somebody but just mass crowd. My wife found me as a peer. She knows who I am, and now it's much easier for her to start talking. Initially I had some difficulty understanding the idea she was trying to convey, as most of us fail in the initial trial. She rephrased so I can understand better. I asked more questions, and she answered. We continued going back and forth but we managed to finish communicating within a reasonable amount of time. At the end of this session, she may have gotten some clue in what order she should communicate each item. She may also have noticed that I found what she had thought to be a minor point as interesting as what she thought to be the focus of the talk. After such dialogue, there are suddenly concrete items we are compelled to tackle right away. The path to the work-done may be still spotty and unclear. But at least we are aware of what are clearly missing. It will at least keep us busy next hour or two. My wife went back to work right away. I am lucky to have my wife, friends, and colleagues who I can talk to whenever I am stuck. And if you also do, I suggest just talk about it to them when you feel the guilt of the procrastination. It's just a simple action, but when we do, we are not procrastinating any more.